I always wondered if you could play a Farfisa Accordian like an organ. It seems like you can from this dark and freaky movie from DottyHarry. OK, now I need to seriously start looking at those when the pop up on craigslist. I bet they weight as much as a mini compact though! 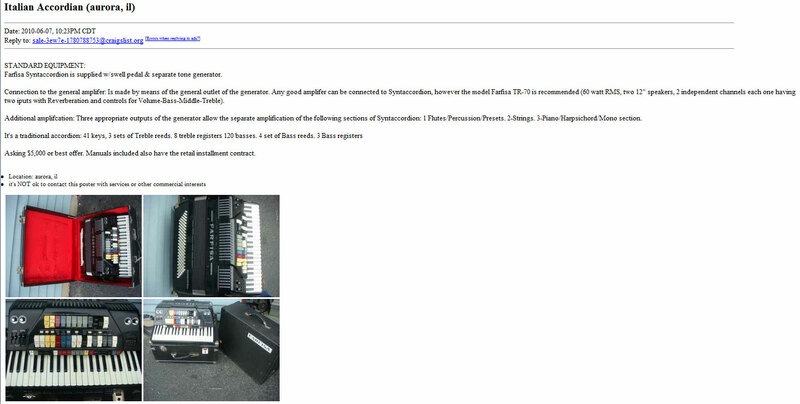 Farfisa Syntaccordion on Chicago Craigslist! Farfisa Syntaccordion is supplied w/swell pedal & separate tone generator. Connection to the general amplifer: Is made by means of the general outlet of the generator. Any good amplifer can be connected to Syntaccordion, however the model Farfisa TR-70 is recommended (60 watt RMS, two 12″ speakers, 2 independent channels each one having two iputs with Reverberation and controls for Volume-Bass-Middle-Treble). Additional amplifcation: Three appropriate outputs of the generator allow the separate amplification of the following sections of Syntaccordion: 1 Flutes/Percussion/Presets. 2-Strings. 3-Piano/Harpsichord/Mono section. Asking $5,000 or best offer. Manuals included also have the retail installment contract. Wildrover434 — May 31, 2010 — Just A Closer Walk With Thee, played on my Farfisa Super Syntaccordion hooked up to my Farfisa TR70-OS amplifier with sferra sound which was supplied new with this accordion and my old Roland Compurhythm CR-8000 rhythm box all dating from the early 1980’s.